Rating 6.258965 stars – Golden Pip! I first read Skellig a number of years ago and instantly fell in love with it. I was fortunate enough to not have the story pushed on me at school and instead find it on my own after leaving school. I now read it at least once every year. It is by far one of my all time favourite stories ever. The past couple of reads have been listening to the audiobook during my daily walks/train journeys and it’s just delightful. Skellig is, on the surface, a story about a boy (Michael) who finds an angel/bird/owl-like man living in the garage of his new home. But it is so much more than that. Skellig is about change. Michael has a new baby sister, a new friend and a new home. Skellig is about discovering there are things in the world that you don’t know about. Michael discovers that men with wings can exist. He learns about arthritis and William Blake and homeschooling and how birds have hollow bones. He learns that life can sometimes throw us a curveball that feels very unfair and there is little you can do about it. Skellig is about friendship. Michael meets a girl, Mina, and becomes her friend without it becoming a love story. It is so nice to have a relationship develop in a story without it having to become romantic because get this – sometimes males and females can become friends without falling in love!. Skellig is about hope, and hardship and the subtle beauty of nature. Skellig is about helping those in need despite how difficult it can be. Most of all, Skellig is also about yummy yummy delicious chinese take out food. Sweet and Sour = nectar of the gods. I watched a spider scrambling across his face. He caught it in his fingers and popped it in his mouth. 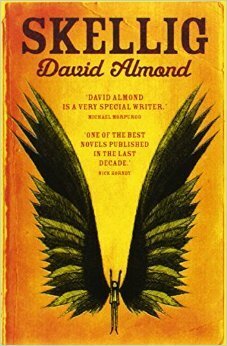 David Almond writes his characters so well. They all feel real, and deep. Even though we don’t spend too much time with some of them, it really didn’t take much imagination to feel like I knew them. On a bit of a side note, one thing that can make or break a story for me is dialogue. Bad dialogue, no matter how good a story is, has me nope-ing out so hard. Skellig is a masterclass in how to write dialogue. It just feels real. When I slept, I dreamed that my bed was all twigs and leaves and feathers, just like a nest. The amount of really well written metaphors and themes throughout this book is a delight. One example of this is how Michael is told to view his new home in his mind’s eye and the potential it has. He has to view the man in his garage and the situation with his sister in a similar light. No matter how grubby, repulsive or broken a situation or person may appear, with the right determination and help, these situations can be transformed into something more beautiful than anything originally thought. I thought he was dead. He was sitting with his legs stretched out, and his head tipped back against the wall. He was covered in dust and webs like everything else and his face was thin and pale. Dead bluebottles were scattered on his hair and shoulders. I shone the torch on his white face and his black suit. I could gush over this story for another 7000 words, but I will stop – I think you can see how much I love it. Anyway, I’m off to make clay figurines. Peace and Love. Honestly, I don’t read children’s books at all… I don’t know why… I think I am in search of something to fit my cynical, bitter state of mood more with thrillers and grim and adult fantasy, but… I want to read this book. It sounds absolutely, as you put it, delightful! Fantastic review! I loved it when I read it a few years ago. I knew I recognised the name of this. I’m pretty sure a load of people were reading it when I was in school, but I never got around to it. I think I might have to change that. It sounds like a beautiful book. I think it’s great when children’s books can explore themes like change. I think very often books can be dumbed down a little too much for younger readers so it’s great when books such as this (A Monster Calls springs to mind too) can tackle themes that everyone will face in their life at some point or another. Great review!